You can’t go wrong with the classic chocolate and peanut butter combo . . . and these cookies are incredibly moist and delicious! If you have never tried a pudding cookie recipe before, I highly recommend starting with these. They are divine! Add in eggs and vanilla, mix until combined. Put flour, baking soda, and salt into a separate bowl and mix together. Add in pudding (do not prepare pudding, add it to mix in powder form). Fold in peanut butter chips and Reese's and mix until just combined (don't over-mix it). Place heaping tablespoonfuls onto cookie sheet and bake for 9-10 minutes (don't overbake). Let cookies cool for about 10 minutes before removing them from the cookie sheet. for style, beauty tips, daily deals, tutorials and more! Looks really fantastic, getting tempted just by looking at it. 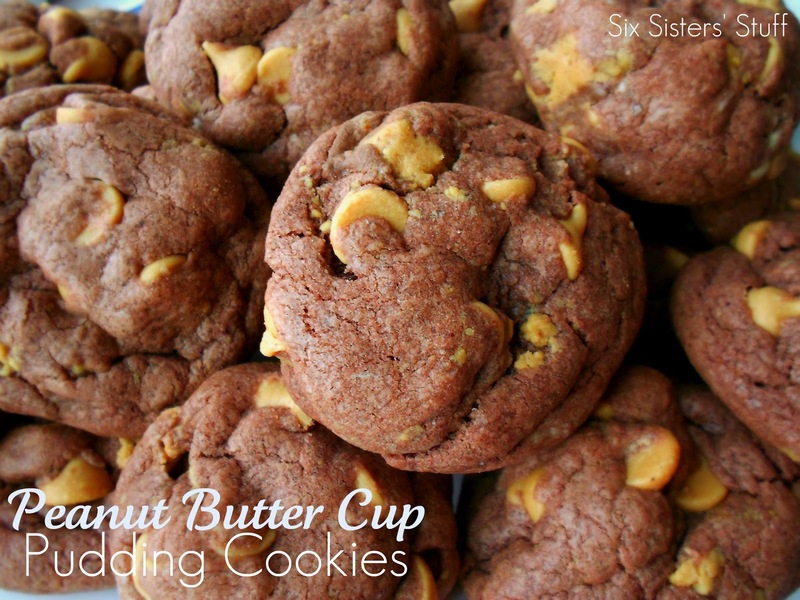 I agree you can never go wrong with peanut butter and chocolate:-) These look scrumptious!!! Pudding cookies have always been my favorite...I have over a dozen pudding chip cookie recipes on my blog...I never thought about putting Reese's Cups in them before-genius! These look way to good to not eat just 5. I will definetely be making these sometime. These look a little dangerous to have around the house, especially for me! Thanks for sharing! I think I'm going to try these this weekend. How many were you able to yield from the recipe? Wow! I really need to try pudding cookies. These make my mouth water! Two things: 1) These look AMAZING!!! and 2) I'm your newest Linky follower! Have a great weekend! I made this yesterday and they were a hit! Thanks! I just featured this recipe on my Cookie Time Tuesday! I can't believe how amazing these turned out. Thank you so much for sharing! This is best recipe which i tryed last week. it really came out well. I Regret making these cookies!!! Only for the fact that they were SO GOOD and I ate tons of them! So that really is 1 tablespoon of vanilla? Yes, it's 1 tablespoon of vanilla. But we used imitation vanilla. If it's pure vanilla you may want to reduce the amount to 1 teaspoon. I would love this recipe, but nothing is showing under Ingredients, and only a partial post under Directions. I even pinned, then looked at it, and same thing. Help!! Hi Debbie, I just pulled up the recipe on the post and it looks fine. All of the ingredients and directions are there. Not sure why it's acting funny on your end. Can you please tell me about how many this will yield? I have to do gift bags for the elderly and need to figure out if I will have to double the recipe. This recipe yields about 24 cookies. You could get more if you roll the balls smaller.